The Night Shift™ system uses vibrotactile feedback to discourage supine sleep and treat mild to moderate sleep apnea and snoring. Supine feedback is initiated only after the patient falls asleep; the frequency and intensity of feedback adapts to meet the requirements of each user. Web-based reports provide compliance information associated with changes in sleep position efficiency and snoring. The low-profile enclosure and quick-release magnetic buckle enclosed in a soft silicone neck strap provides a comfortable, safe and secure resulting in high levels of patient compliance. 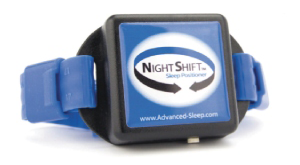 The Night Shift™ provides a cost effective , simple solution, to treat the mild to moderate supine apnea and snorers. Click Here – to watch the YouTube video presentation to find out how the Night Shift™ works. The Night Shift™ – simple to use and comfortable to wear. The Night Shift™ is a clinically proven solution for patients with positional obstructive sleep apnea (POSA) and snorers. Worn on the back of the neck, Night Shift™ begins to vibrate when the users start to back-sleep. The vibration slowly increases in intensity until the user changes positions. Would you like to purchase the Night Shift™? – We are delighted to be able to offer you the ability to order this item online – visit our ‘Order’ page and follow the on page instructions to process your order. Alternatively, if you would like to discuss your interest in ordering this product in more detail, please contact us using our online contact form or contact us directly on 01451 812 402 / info@gds-medtech.com.